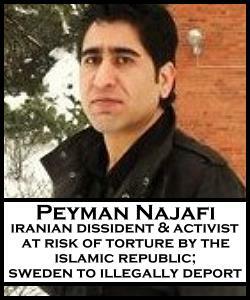 URGENT: Letter-Writing Action: Stop Sweden’s Illegal Deportation of Peyman Najafi! PLEASE SEND THIS SAMPLE LETTER (adjust to your own taste) TO STOP THE ILLEGAL DEPORTATION OF IRANIAN ACTIVIST PEYMAN NAJAFI. Peyman’s illegal deportation by the government of Sweden is scheduled for 12 August 2011. The Swedish government has already bought his tickets and is determined to send him to detention, torture, and possible execution. It is up to us to do all in our power to stop this crime. Peyman is counting on us. Please help to save the life of Payman. Freedom for all political prisoners in Iran and all iranian people. From Germany Herbert Sturm. Please help to save the life of Payman. Freedom for all political prisoners in Iran and all iranian people.